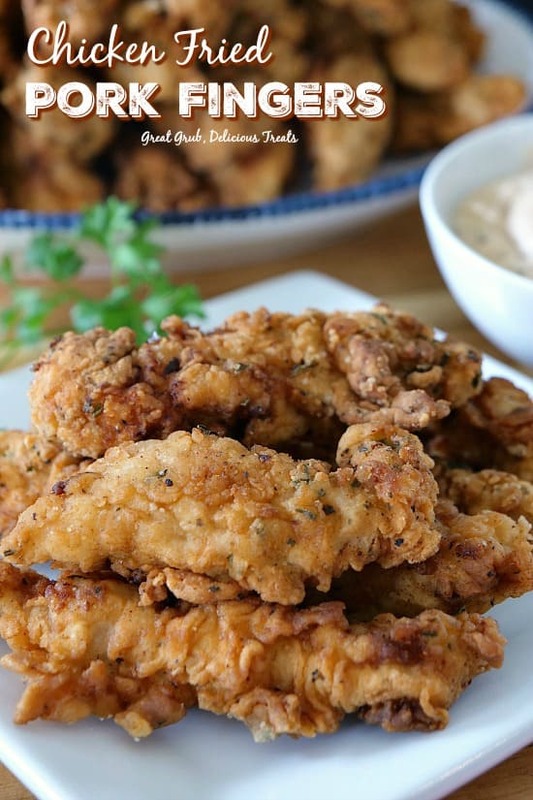 We love chicken fried anything and these chicken fried pork fingers are super delicious, loaded with the perfect blend of spices and then fried to perfection. 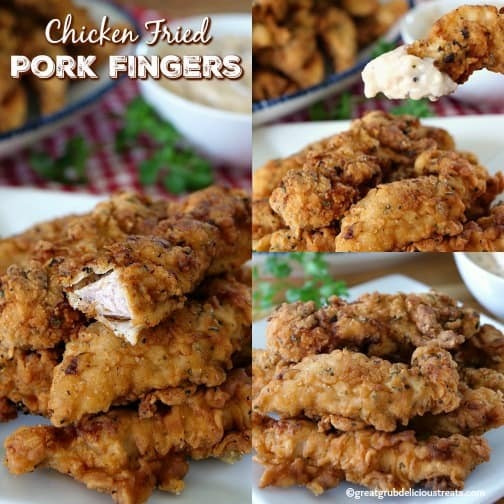 Having an easy recipe is the best and these pork fingers are just that, easy! 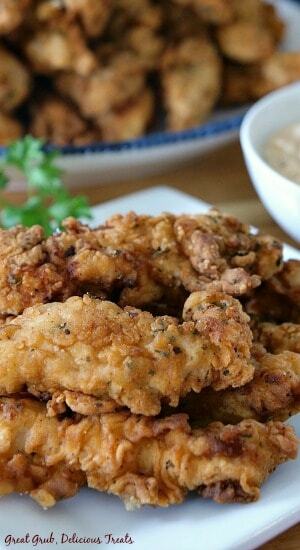 With just a few ingredients that you probably have in the pantry, plus the buttermilk and eggs, you could be enjoying these chicken fried pork fingers tonight for dinner. 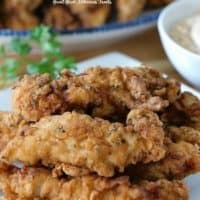 The crispy coating used for these chicken fried pork fingers is one of the reasons these are so delicious. The flavor of the seasoning is what makes these so yummy! And then once they are fried to a golden brown, and dipped into a delicious side of country gravy, these pork fingers are to die for. Start out by heating the oil in a large cast iron pan or an electric skillet to 375°. Cut pork into 1/2 inch strips and place on plate. While the oil is heating up, add one cup of flour into a large baggie then the remaining flour into another baggie with all of the seasoning. Shake to mix. Whisk eggs and buttermilk together in a bowl large enough for the pork strips. 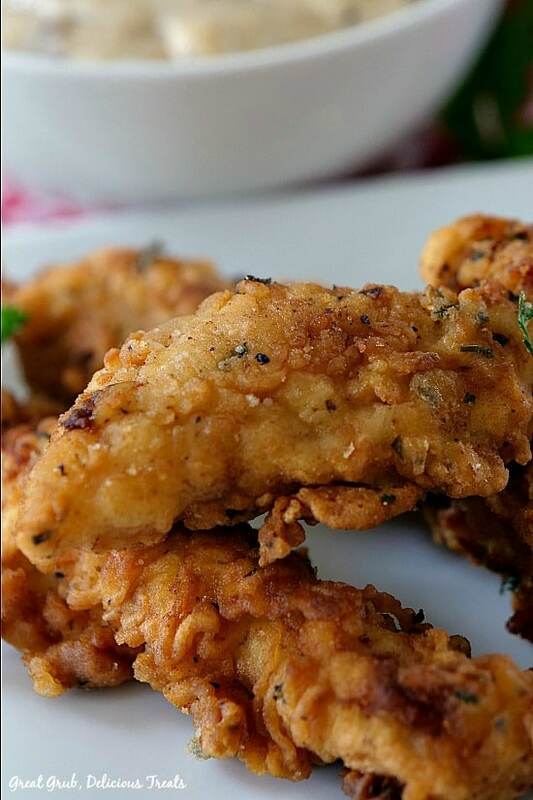 Once the oil is ready, place about 6-8 pork fingers into the baggie with the plain flour, seal and shake to coat. Next add fingers to the egg mixture, then into the flour with the seasonings, then into the skillet. 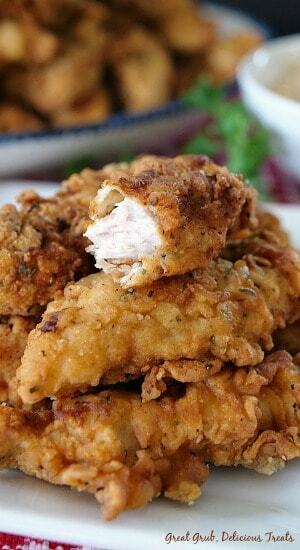 Fry until golden brown on both sides. Approximately 3-4 minutes on each side. Once the first batch is cooked, place on a plate lined with paper towels. Place into a preheated oven at 175° to keep warm while the rest of the pork fingers are being fried. Repeat the coating process for the remaining pork. 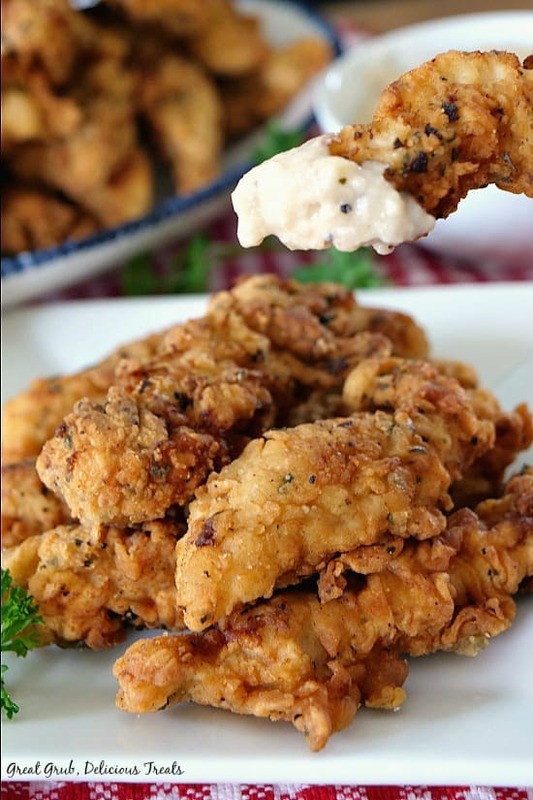 Here are a few more delicious recipes that can be found on the blog: Chicken Fried Steak Fingers, Potato Cheese Soup, Beefy Taco Goulash, Italian Sausage Penne Casserole, Cajun Shrimp Fettuccine Alfredo, plus many more. Using an electric skillet, or large cast iron pan, heat oil to 375°. Cut pork into 1/2 inch strips and place on plate. While the oil is heating up, add one cup of flour into a large baggie then the remaining flour into another baggie with all of the seasoning. Shake to mix. Whisk eggs and buttermilk together in a bowl large enough for the pork strips. Once the oil is ready, place about 6-8 pork fingers into the baggie with the plain flour, seal and shake to coat. Next add fingers to the egg mixture, then into the flour with the seasonings, then into the skillet. 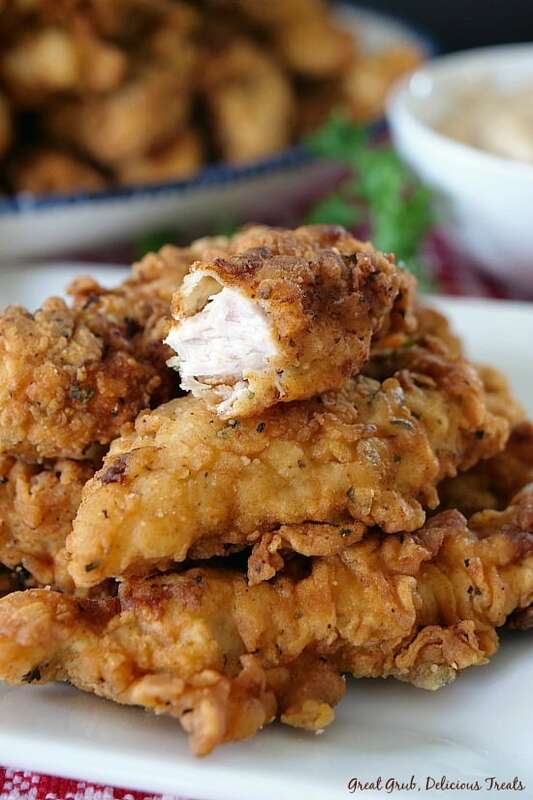 Fry until golden brown on both sides. Approximately 3-4 minutes on each side. Once the first batch is cooked, place on a plate lined with paper towels and place into a preheated oven at 175° to keep warm while the rest of the pork fingers are being cooked. Repeat the coating process for the remaining pork. 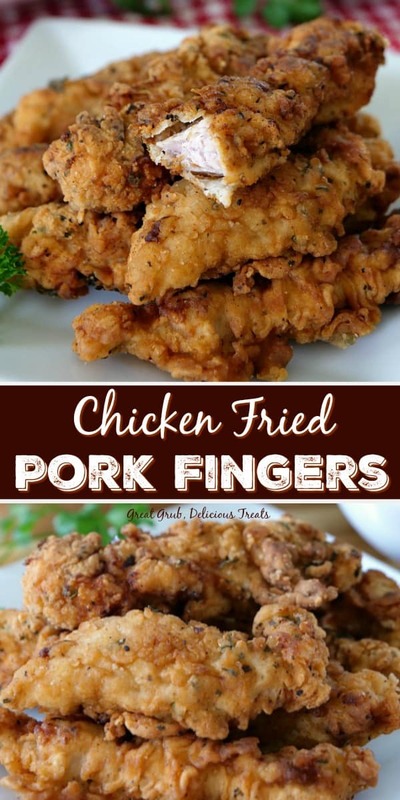 *For best results, make sure to coat the pork fingers right before going into the skillet.